The holistic industry is a multi-billion dollar industry that has grown and continues to grow steadily yet many providers struggle to make ends meet. The first reason holistic businesses struggle is often due to a belief that financial gain is somehow antithetical to spirituality and authenticity. The second, more practical and easier to solve reason holistic business are not as profitable as they would like to be is they try to promote their businesses with a generic ‘mass market’ approach. That doesn’t work. To effectively promote your holistic products and services, you need to address several strategic and tactical aspects that are unique to this market. First, if you’re looking for new leads/clients, you have to accept that there is a lot of cynicism, skepticism and doubt. If you can’t overcome that, you’re dead in the water. This means you have to initially create credibility and then have belief builders to reinforce your message consistently. Second, you need to recognise this is a niche industry – even though it’s huge in its overall scope and breadth. That means your syntax, vocabulary and communications must be tailored to your audience so that you speak directly to their concerns, desires, wants and needs in a language and context that resonates with them instantly. Third, you must be omnipresent within this niche community – that includes being in publications like Living Now Magazine and involved with other community leading organisations and activities. You must leverage the holistic community authentically, but effectively. Traditional media channels cannot provide the ROI you need to justify the sales and marketing expenditure required to generate the sales you want and need. It’s a key distinction that will make all the difference. Fourth, to get out-of-the-ordinary results, you need to do out-of-the-ordinary things without being provocative or sensationalistic. Otherwise, prospects who want to buy what you have to sell won’t find you – they’ll go to your competitors. I acknowledge that all of this is much easier said than done – until you embrace your purpose and realign everything you do into a consistent approach that remains congruent to your values and beliefs. When everything lines up, the multiplier effect is magical and unmistakable. This detailed report covers the following important points that are of specific interest to you if you provide products or services to the spiritual, holistic, or natural niche marketplace. The #1 reason people don’t buy from you and what you need to do to change that. The top objection people have when considering holistic products and services that compete with traditional solutions or providers. How to overcome cynicism and skepticism while maintaining your authenticity and integrity. How to price products and services to attract more clients without compromising your profits. How to counteract well funded competitors within or outside the holistic space. How to balance your need to promote yourself and your products to entice your prospective buyers, without giving everything away for free. How to deal with dishonest claims or negative propaganda by traditional solution and service provides without engaging in a war of words. This document caters to sole practitioners including: healers, spiritual advisers, chiropractors, physiotherapists, myotherapists, massage therapists, kinesiologists, naturopaths, nutritionists, etc. Anyone catering to the holistic, spiritual or alternative health and well being marketplace has challenges and roadblocks to overcome. Once you know what they are and how to avoid and/or deal with them, you can then return to your chosen path and get on with your journey to improve the world one more person at a time, focusing on what you do best as you begin to attract more clients, followers and advocates. The law of attraction is a powerful concept, but without the right strategies, tips and tools to assist, it remains impotent and inert. Conversely, if you have decided on your manifestations, what I will reveal to you will provide an almost magical result, fuelling your goals and desires in a self-perpetuating manner that will become soon become effortless. More importantly, the strategies I will share with you are founded on a fully integrated approach that revolves around your authenticity, integrity and purity of intention. They can only work their magic when you are aligned with your life’s purpose, primary intention and pure spirit. Sponsored by Living Now Magazine, you can download it at no cost by filling in your contact details below. Please feel free to share this new found knowledge with your colleagues within the holistic community. 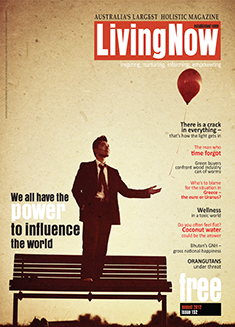 Living Now Magazine is committed to providing on-going support to this vitally important community.